There are some really good article on the site above plus if we lived in the Parys area would definitely check out this vet! 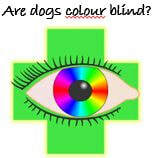 When a human perceives a red object it appears as yellow to the dog, while a green object appears as white or a shade of gray. When I first heard the question: Are ice cubes dangerous?, my first response was: "only if someone throws an ice cube at a dog’s eye," but this question seemed to linger, gaining momentum due to a post online. ​Have you wondered if tripe would do any good for your dog? Learn about what tripe is, the types of tripe, and how tripe is beneficial for dogs and cats.